Posts Tagged "Fifa World Cup"
Home » Posts Tagged "Fifa World Cup"
Top Left to Right : Haoos of Germany with the soccer hair look most had, but better than most … Next to him a little slash to one side .. England’s Trippier also has his slash to one side, a littler longer … Parts zoomed at the back for France (Matudi) and Nigeria. 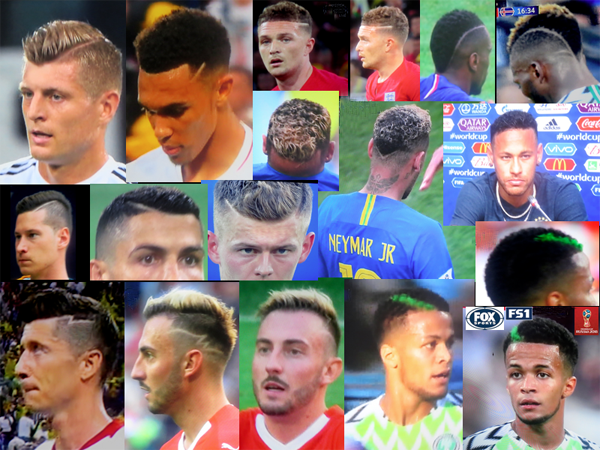 Middle Row : Hair part, fade … Portugal’s superstar Ronaldo just had a small slash at the top … Some had two parts, one either side … Brazil’s superstar Neymar started as a blonde with a ‘V’ slash at the back, then he changed to his natural color. Brazil is out, so we miss Neymar’s winner. Bottom Row : Poland’s Robert Lewandoski with his zig zag (thanks to Charles for starting me on soccer hair!) …. Another zig zag, blonde on top … Green stripe for Nigeria. Stay tuned for the Semi Finals on Tuesday and Wednesday, England vs Croatia, France vs Belgium, the Final on July 15 on Fox.